Mother Nature is displaying her radiance at the Brooklyn Botanic Garden. The first cherry blossoms of the season have been spotted on the garden’s Prunus-sargentii ‘Fudan-zakura’ and Prunus ‘Jugatsu-zakura’ trees, located in the Japanese Hill-and-Pond Garden and along the Cherry Walk. And, Earth Day’s 48th Anniversary is April 22nd a global event to support environmental protection. This day we reflect on the environment, so let’s turn-off our lights and gadgets and ride a bike or picnic in the many beautiful parks throughout the City. From 9am to 3pm on Saturday April 21, the city is making Broadway between 47th and 26th Streets completely car-free. 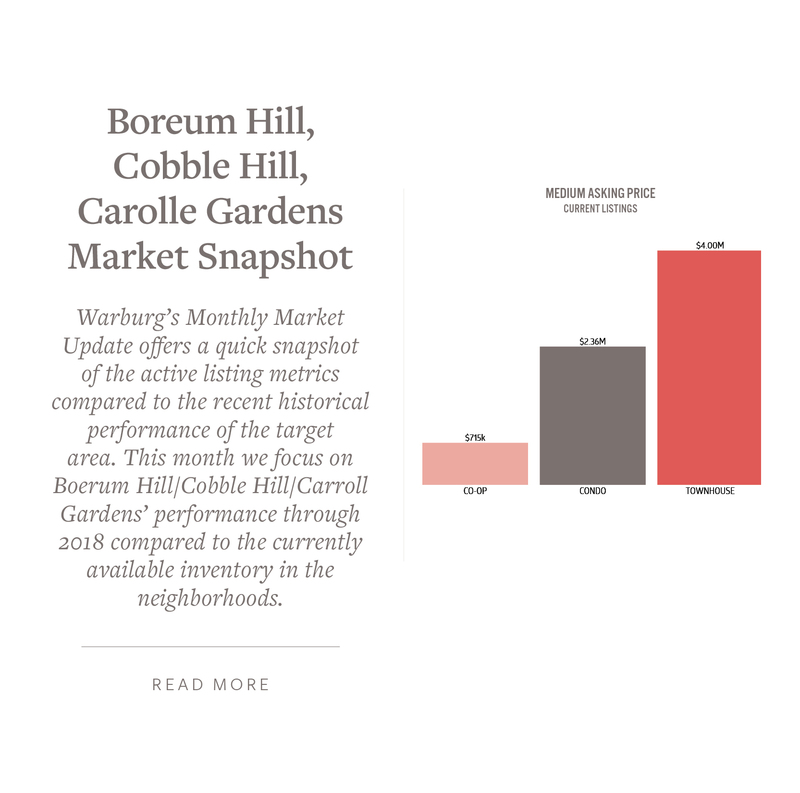 This month’s Culturally Inclined focuses on Boreum Hill | Cobble Hill | Carroll Gardens aka BoCoCa a portmanteau word combining the three adjacent neighborhoods in the Brooklyn borough of New York City. BoCoCa while not a neighborhood is an umbrella term for the region of Brooklyn directly south and southwest of Downtown Brooklyn. 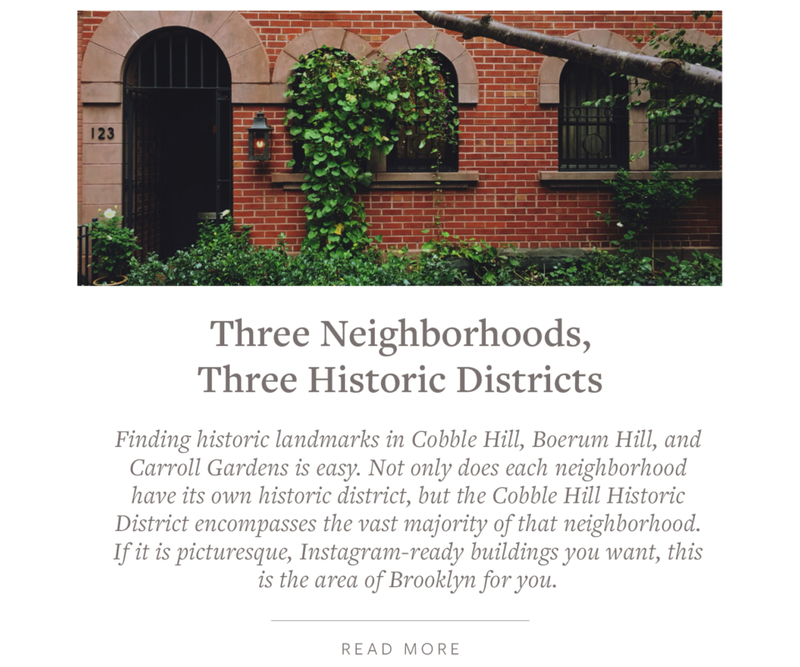 This spring take the time to ramble through picturesque historic districts of Boreum Hill, Cobble Hill and Carroll Garden areas designated in the maps in the links. Visitor’s Guides by New York Magazine’s and Explore Brooklyn offer some good places to hunt out the stylish boutiques, hottest cocktail dens and gourmet bakeries. 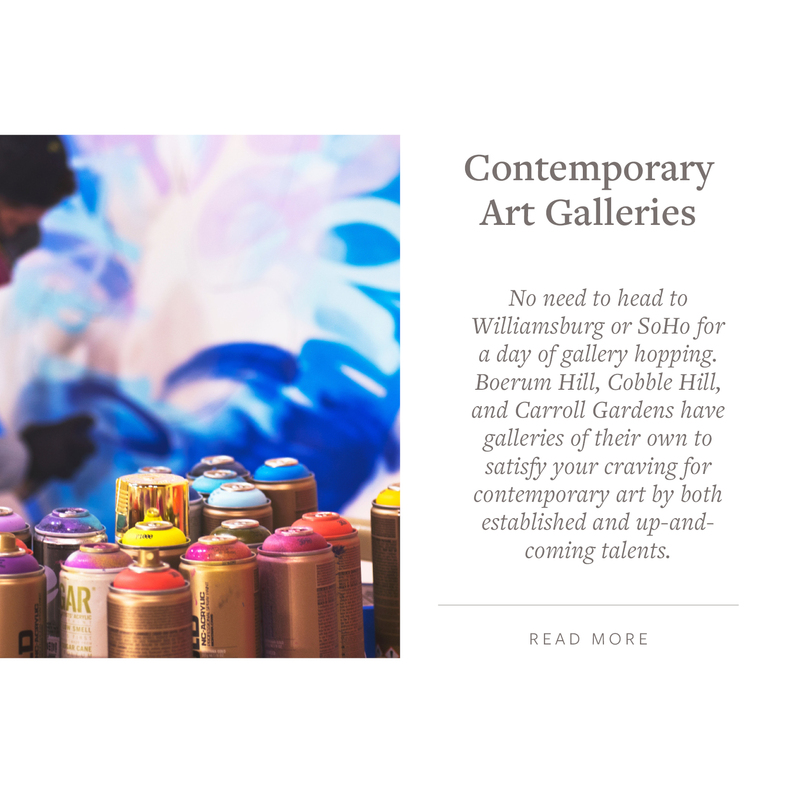 The articles in Culturally Inclined highlight the three distinct historic districts, the origin of the areas names, the many independent boutiques and shops, the good Italian restaurants to be explored, vast yoga opportunities to sooth your inner soul, contemporary art galleries showcasing up-incoming artists, food, drink, and song to help you unwind during the week, top active listings in area (click on links to view lists) and a quick market report snap shot. The Boreum Hill district is characterized by its modest scale, visual coherence and architectural integrity. The majority of the row houses were designed in a modified Greek Revival or Italianate style with excellent examples of the Gothic Revival, French Second Empire, Greek Revival and Queen Anne styles also occur within the area and contribute to the district’s qualities. The neighborhood, originally offered economical housing to local merchants and businessmen, is comprised of approximately 250 row houses and several small-scale commercial structures built between 1845 and 1890. Boerum Park named in honor of Simon Boerum (1724-1775) whose family farm occupied the surrounding area in the 18th Century is an historic treasure. In the park is the old Long Island Rail Road tunnel located under Atlantic Avenue, the oldest in Brooklyn. The Brooklyn and Jamaica Railroad in the 1840’s started from Boerum Place to the waterfront primarily to transport produce to the ferries to disperse to Manhattan grocers. The tunnel is now open to the public on selected Saturdays during the summer. 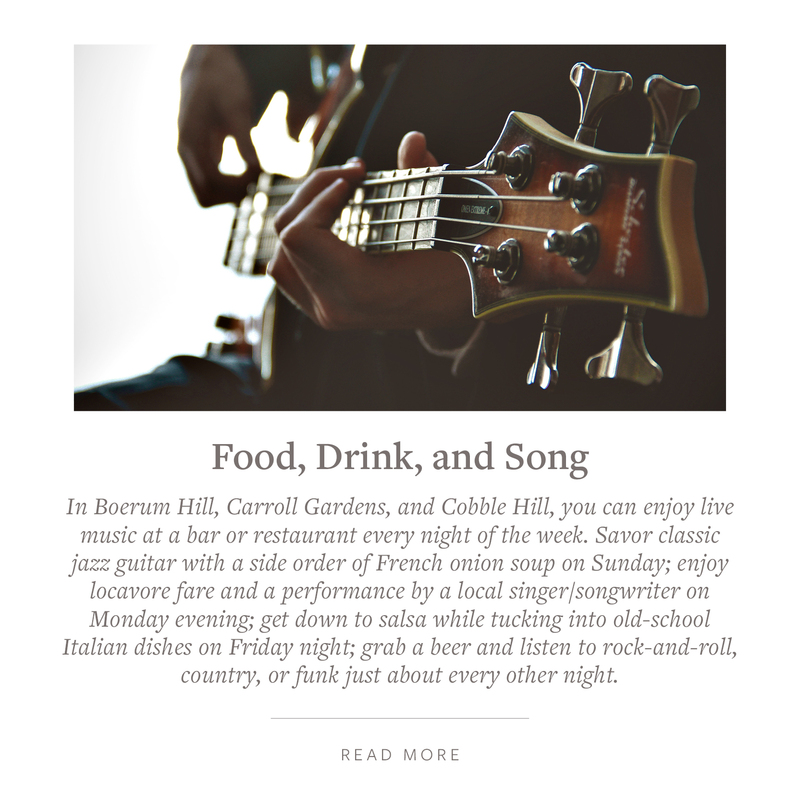 So, ramble around the park and meander around this village vibe community touring the Shops | Food & Drink | Cultural Landmarks | and Green Space. The Carroll Gardens district was developed during a short period of time between the 1860s and the 1880s and is a notable result of the cooperation of different builders in employing uniform setbacks, scale and materials and in choosing complementary designs for the row houses, mainly in the late Italianate and Greek Revival styles. The district is especially distinguished for its unusually deep building lots which allowed for fenced front yards and landscaped gardens and created a sense of open space unusual in New York’s urban environment. Carroll Park is Brooklyn’s third oldest park. 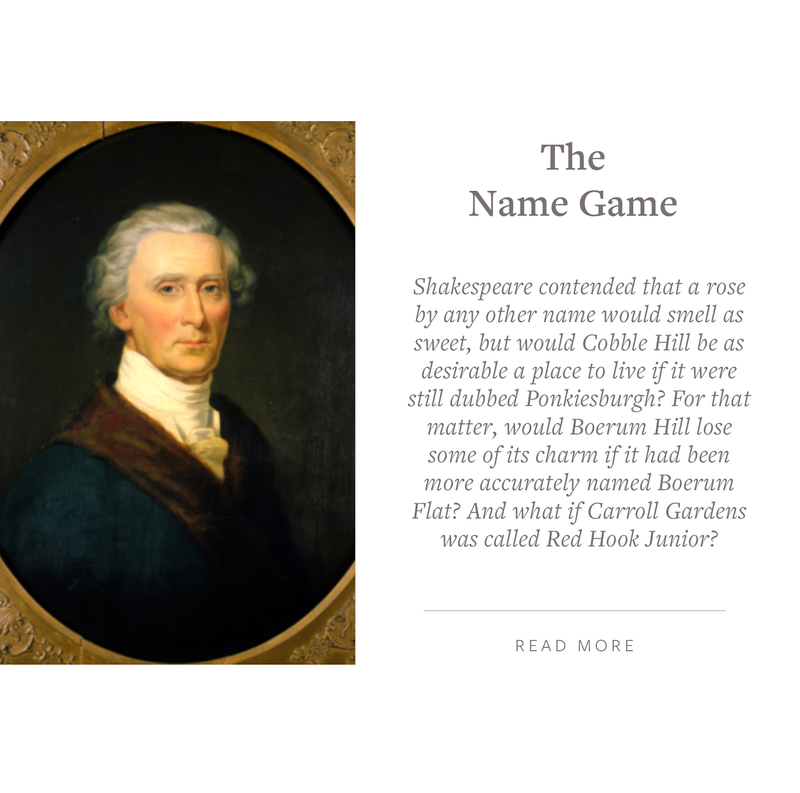 The park is named for Charles Carroll an American Revolutionary leader and signer of the Declaration of Independence. While we celebrate the Declaration of Independence on July 4th it was actually signed on August 2nd, 1776 at the Pennsylvania State House, Independence Hall in Philadelphia, Pennsylvania. The Friends of Carroll Park will be hosting their Annual Carroll Park Fair – Saturday, May 19th there will be live music, face painting and many more fun outdoor activities. Dining and Spirit Selections: | Other Half Brewing Company | Lucali – Pizza | Sal’s Pizzeria & Mama Mari’s | Buttermilk Channel | Frankies 570 Spuntino | Battersby | Leyenda Brooklyn Cocteleria | Brooklyn Farmacy & Soda Fountain | El Mate | Cafe Booqoo | Panzerotti Bites | Clover Club | Ferdinando’s Focacceria (Columbia Street Waterfront District) | Bar Harry | Black Mountain Wine House with its working fireplace is a favorite of mine on cold days. 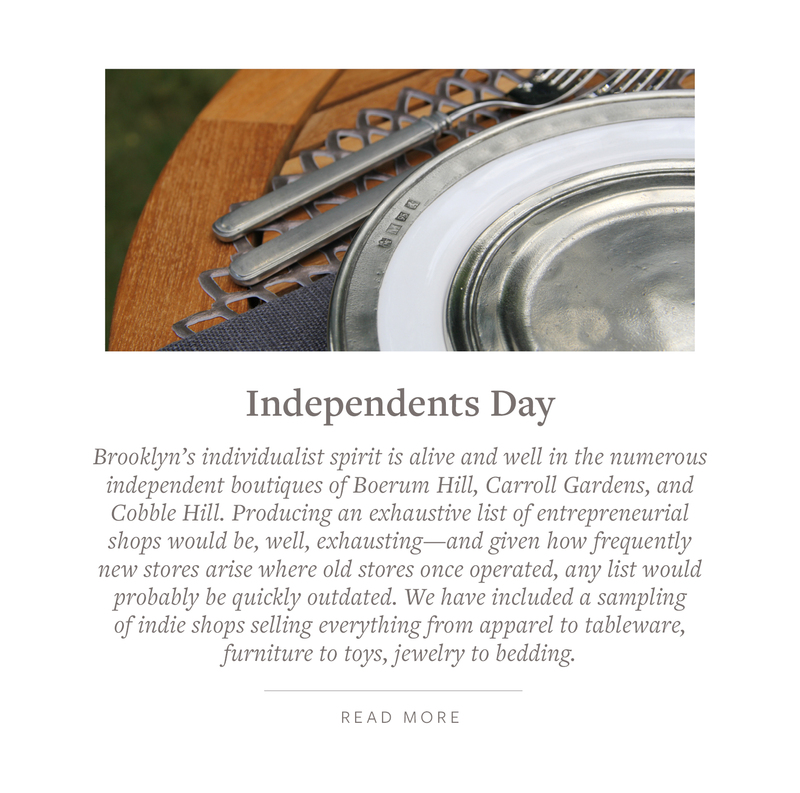 Cobble Hill a neighborhood known until the post World War II era as South Brooklyn. 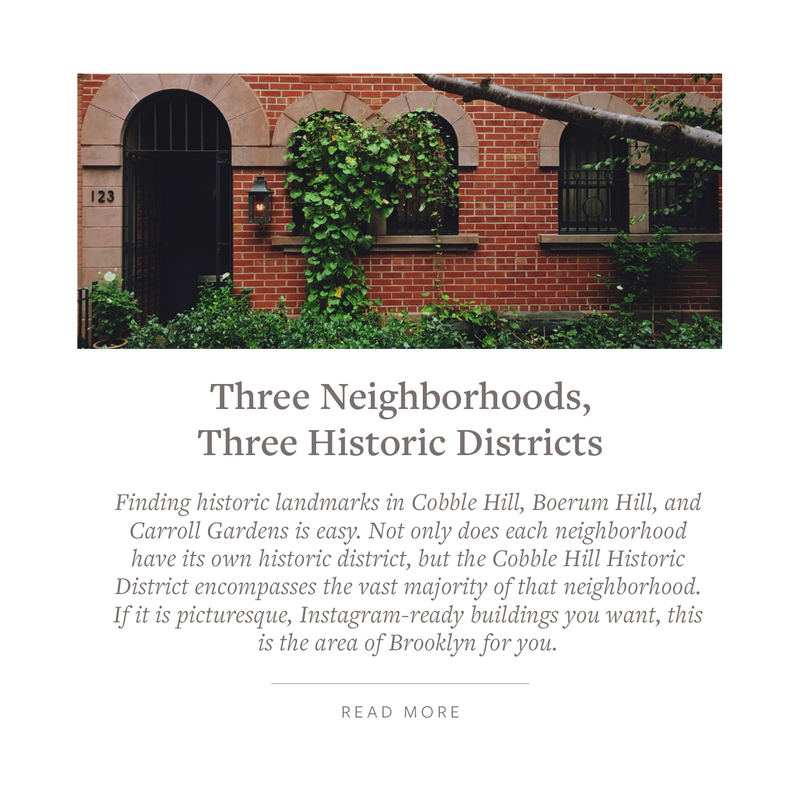 By 1860 most of the land in what is now the Cobble Hill Historic District was built up, primarily with brick and stone single-family row houses and institutional buildings constructed to serve the needs of area residents. Development continued after the Civil War to the turn of the 20th century. It was during this time that this area of South Brooklyn began to develop its unique architectural character. Cobble Hill Tree Fund beautifies Cobble Hill and the contiguous neighborhoods by planting and caring for street trees maintaining the charm and the desirability of the area. Cobble Hill Park reconstructed in the late 80’s and the new design won the Annual Award for Excellence in Design from the Art Commission and the Parks Council’s first Philip Winslow Award for Public Projects in 1990. The steel-panel fencing and concrete slabs of the 1960s park were replaced by a design more in harmony with the surrounding Greek Revival architecture. The formal, geometric pattern of present-day Cobble Hill Park utilizes 19th-century period materials such as blue stone and cast iron as well as granite entrance columns and herringbone-patterned brick walkways. When in Cobble Hill start or end the day at 61 Local. They serve gourmet coffee, tea and pastries from Bien Cuit (2017 James Beard Semi Finalist Zachary Golper – Outstanding Baker), Megpies (aka PopTarts), and Ovenly (Award Winning Baker – “Think currant-rosemary scones or black caraway-chocolate shortbread) and later unwind with one of their 30+ tap lines pour a rotating selection of local beers, wines and specialty craft drinks. Grab a drink, head upstairs, and enjoy the night’s event. You can find comedy shows, book launches, poetry readings, music, and more. 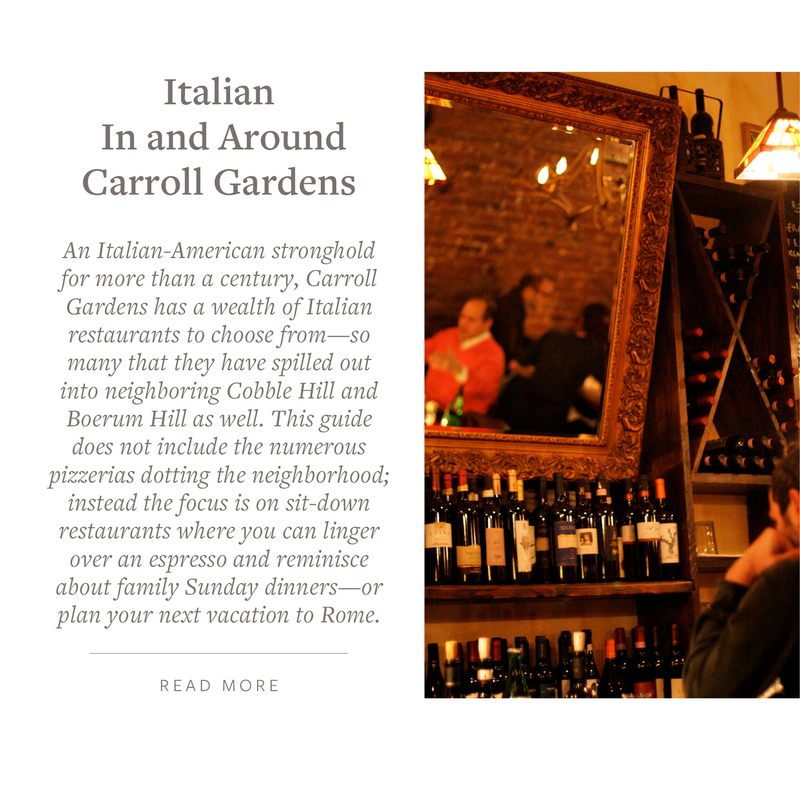 The Cobble Hill neighborhood has plenty of architectural beauty that can be viewed on a walking-tour or you can choose to shop at the best gourmet Middle Eastern Grocer Sahadis, or take in a movie at the Cobble Hill Cinemas once the Lido Theater and Rex Cinema. There are plenty of food establishments readily available to be tried. I have faith that Mother Nature will be displaying her glory and wonderment very soon. Keep me in the loop if you or someone from your network would enjoy a Sunday Open House list for an area they are exploring or would like a neighborhood Market Report. It’s always a pleasure to hear from you so give me a call and let me know what’s on your mind. "Karen completely changed my opinion of brokers. She is incredibly professional, mentored us through the process, is formal in a pleasant but warm way, and I’m going to make all of my friends go to... continued"